Published in the South Kent Gazette, 15 August, 1979. As to the origin of the name Dolphin Lane, we can only speculate. There was an Inn in this thoroughfare called the “Dolphin,“ and that, no doubt, was an old establishment, but it is not probable that the lane took its name from that. There are several old meanings to the word “dolphin.“ One is, a ring or a mooring post to which to fasten; boats or ships; and, seeing that in early times vessels came up the river as far as this lane, it is reasonable to suppose that there was a mooring post there, and the lane might have taken its name therefrom. Or, it might have been originally called Dauphin Lane owing to the Dauphin of France landing his siege plant here when he besieged the Castle in 1216. Apart from the name, the antiquity of this road is unquestioned, and it is easy to imagine it leading from St. Martin-le-Grand, over the river, following its present route, and continuing up Castle Hill by the ancient path known as Monk’s Walk. That road, no doubt, existed from the time when King Withred removed the Canons from the Castle to their new quarters in the Market Place. Of a later date, we find, branching off westward along the river side, St. James’s lane. Here, in ancient times, was one of the principal quays of Dover, and it is pretty certain that here was landed much of the material which the Norman Kings imported to build the keep and towers of Dover Castle. Dolphin Lane Gate was in the town wall, which crossed the lane 180 ft. east of the river. The lower part of Dolphin Lane now ends at a footbridge over the Dour which leads to the rear of Dolphin House, a block of Market Square shops with flats above which was built after the Hitler war. The narrow passage which was the continuation of the lane into the Market Square was closed when these shops and flats were built. Probably the last cobbled carriageway in Dover, Dolphin Lane used to be flanked by Messrs. Leney’s former Phoenix brewery premises. There was a brewery here in the 18th century, and in 1808 it was a flourishing concern, owned by Mr. James Walker, who, at that time, considerably developed it, and erected some steam machinery, which was superseded by more modern plant during the greater development of the business in the hands of Messrs. Leney and Co., the buildings at one time covering over five acres. At the beginning of 1927 Dover lost this, the last and the oldest of its breweries, Messrs. Leney and Co. amalgamating with Messrs.- Fremlins, Ltd., of Maidstone, to which town their brewing work was transferred. The brewing plant was sold, but part of the premises was subsequently used for bottling, etcetera. Then the site became redundant and was sold. A multi-storey car park now occupies part of the site. Fifty years earlier there were no less than seven breweries at work in Dover, viz. 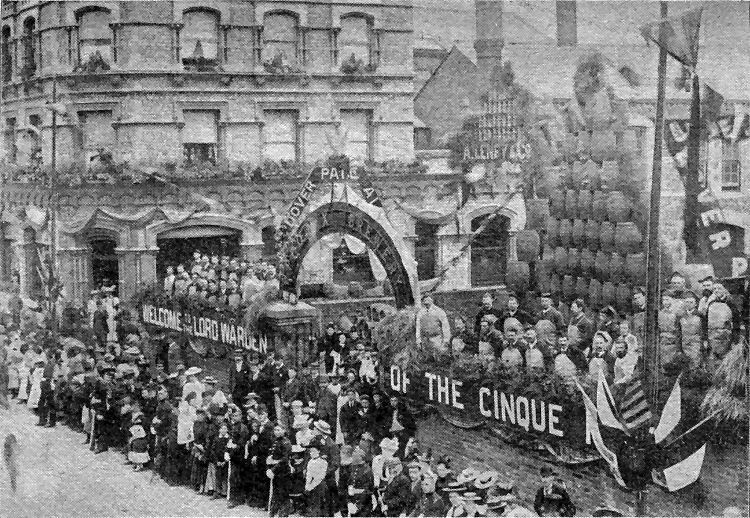 :— "Cliffe’s Brewery," at Archcliffe; "Satchell’s," in Limekiln Street; "Leney’s," in Dolphin Lane; "Poulter’s Castle Brewery," in Russell Street (afterwards Leney’s); the "Diamond Brewery," at Maxton; "Harding’s Wellington Brewery," in London Road, at the rear of the Flour Mills; and "Kingsford’s Buckland Brewery," at the premises at the corner of Union Road (later Palmer’s and then, until 1978, Jenkins and Pain’s coachworks.) Earlier still, there were other breweries in Dover, notably, a very ancient one on Custom House Quay. SOLDIERS stand in front of the crowd lining Castle Street waiting to greet the new Lord Warden, the Marquis of Salisbury, on his way to the Installation ceremony at Dover College in 1895. Decorations, as at the Phoenix Brewery yard above, between Castle Street and Dolphin Lane, were lavish. Brewery men built massive pyramids of barrels and doubtless used other barrels to build viewing platforms on which to stand behind the walls. King Street is a short thoroughfare, less than a hundred yards in length, but of noble width, averaging 70 ft. King Street and King’s Lane were terms used in Dover deeds and charters in the Norman period. The name, no doubt, originated from the fact that from the Conquest, and probably earlier, the whole of the property thereabouts was held from the King. The adjoining lane, now called Fishmonger’s, was called King’s Lane, the river at the bottom of it was called the King’s water, and the mill upon it the King’s Mill. Hereabouts were twenty houses which King William I. gave to his brother, the Bishop of Baieux. King Street occupies historic ground, but as we look at the buildings now existing, or by the aid of memory or tradition, recall those that previously existed, we find ourselves poorly furnished with information respecting its early condition. King Street, in Saxon times was, no doubt, the commercial quay of that period. It ran alongside the tidal water of the Dour, and there must have been a very busy time at that quay when the enormous quantity of material was landed there to build the church and monastery of St. Martin-le-Grand, in the year AD. 700. Some traces of ancient buildings, which probably belonged to the monastery, were found in King Street when it was widened at the beginning of the last Century. Under the houses on the western side, which would be about the middle of the present street, was discovered an ancient crypt, or undercroft. It extended from the southern end of King Street about half way towards the Market Place, and parts of it still remain under the road, and below the ruins of the burnt-out "Crypt Restaurant." 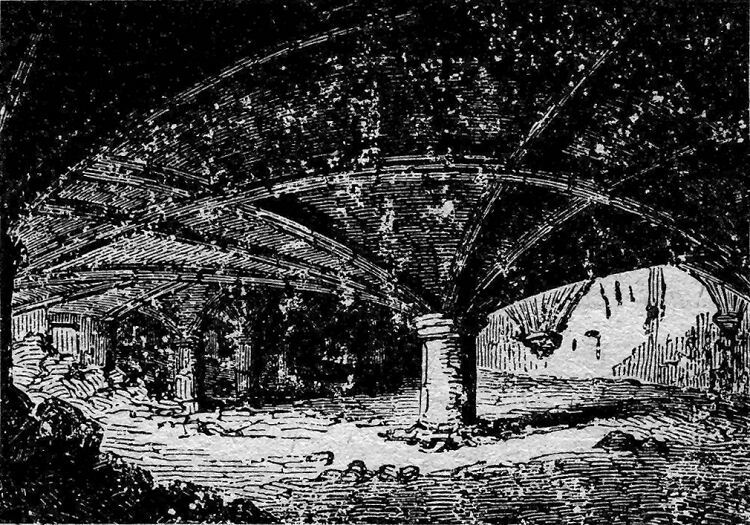 An 1838 print of the mysterious Crypt in Bench Street parts of which still exist in the basement of the burnt-out Crypt Restaurant. It is believed to be part of St. Martin’s monastery. Upon this foundation there remained standing a part of a wall and two Gothic arches, rising 20 ft. above the surface, lacing north. There was ample evidence that the “Flying Horse Inn,“ that formerly stood there (and on the site of which was built the Post Office, now the Employment Exchange) had been to a great extent built out of these ruins. A block of solid masonry, from 7 ft. to 8ft. thick, had to be tunnelled through towards the end of the 19th century, in making a connection with the main sewer from 15, King Street. This, too, must have been an ancient building connected with St. Martin-le-Grand. King Street was a place that bounded the King’s stream, without any intervening buildings, long after the Saxon or Norman times'. As the valley slowly silted up, the stream became narrower, leaving a strip of void land between the street and the river. That was so in the beginning of the reign of Queen Elizabeth, and at that time 'the Corporation let several plots of this void land at fee farm for periods of 99 years; and it is probable that most of the land lying between Fishmonger’s Lane and Dolphin Lane was so let, and built upon at that time, whereby the street was reduced to a narrow lane; and the ancient ruins of St. Martin’s Monastery on the other side of the street and in the Market Place seem to have been the quarry from which most of the building materials were drawn. But although this rough material was extensively used in constructing the riverside houses, elegance seems to have been given to the front, which faced lawns or gardens margining the river, by the use of ornamental brickwork.